After grabbing coffee in the hip cutesy Silver Lake district in Los Angeles, I managed to quickly capture these moments before the sun disappeared. Feeling accomplished that I'm carrying out my New Year's resolutions to incorporate more color into my wardrobe, I'm channeling a bit of the hues of the LA sunset. Now if only I can have the same amount of control to stop scouring endlessly on eBay, although it has led me to treasures like the skull collar tips I'm sporting. Very pretty! :) Loving this casual look. Love your outfit! The little collar tips are fabulous! i'm loving this look! 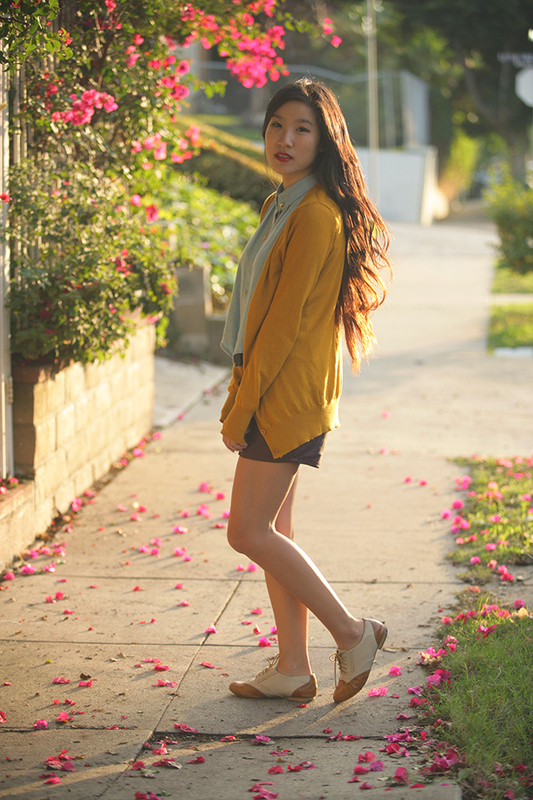 the mustard cardi and the oxfords are so classic, yet you still look very modern! Such a pretty outfit. I love denim shirts. Such a great outfit. I love your hair. in love with this look!! Very casual yet so chic!! And ur hair is so gorgeous.. I think very good outfit! Grate shoes!!! Great look, such a cute cardigan. I love the easy & comfy vibe of this look. Oh wow, girl you are gorgeous! 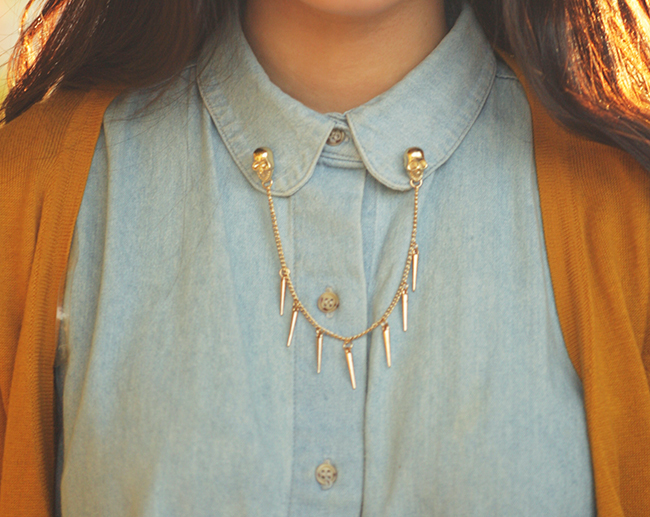 The mustard and oxblood makes such a pretty color combo! LOVE the oxfords so much too :) Your outfits are always so unexpected and amazing. Woah the collar tips are really cool, ebay does have a lot of pretty awesome stuff. love this outfit and these pics are gorgeous! These photos are gorgeous - love the lighting! And such a cute outfit! Hey Sweety! Thanks for your lovely comment in our blog! we also like very much yours, we are following you now via GFC! Gorgeous photos! It looks nice and warm there! You look amazing in these shorts. I love the mustard cardigan too. So cute! Beautiful outfit and great pictures! WOW! Beautiful pictures and outfit! You look gorgeous! Gorgeous pictures! I love your outfit especially the shoes. That's such a beautiful color for the cardigan! wow these photos are stunning, LOVE this outfit! I love the mustard and denim combo, You look great! Lovely photos! I like the colors..
REALLY REALLY love this look!Gorgeous pictures and colors of these photos are beautiful!